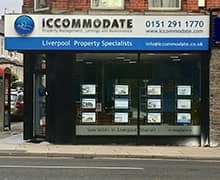 iCCOMMODATE Ltd is located on the very popular Smithdown Road, just outside the city centre. Most of our current properties are in the immediate area surrounding our offices meaning we're never far away should you need help, advice or any maintenance. © iCCOMMODATE. All rights reserved.